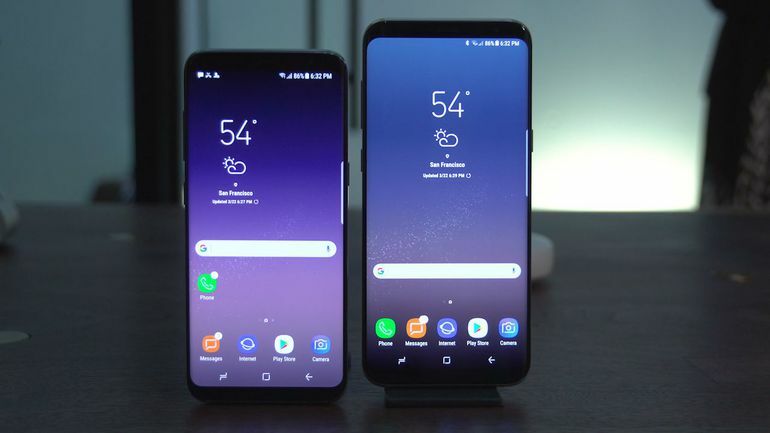 Samsung Galaxy S9 and S9 Plus display sizes leaked. Home Samsung Samsung Galaxy S9 and S9 Plus display sizes leaked. Samsung is all set to launch the Samsung Galaxy Note 8 this August/Sept and now we have rumours of the next Samsung Galaxy S9 & S9+ with Note 9 too.Earlier we saw the Samsung Galaxy S9 running with SD845 chip and was spotted on GeekBench. According to Industry sources, the Samsung Galaxy S9 & S9+ will feature similar display as S8 and S8+. The Samsung Galaxy S9 will now have 5.77 inches and S9+ will have 6.22 inches display.Even the Note 9 display sizes are mentioned. The Samsung Galaxy Note 9 will come with 6.32 inches display as per rumour. The next rumour is the Samsung Galaxy S9, S9+ & Note 9 to feature fingerprint scanner below the display.It is similar to what Vivo and Qualcomm implemented and was shown in MWC China.All the display of above-mentioned devices will still be called as Infinity display.The upcoming Samsung Galaxy S9 & S9+ will feature a nearly bezel-less display with rounded edges. We have to wait longer for official launch as it will be launched only in March 2018.So it is too early to comment on the display sizes and features. Samsung Galaxy S9 price in India. Previous articleSamsung Galaxy C10 live images leaked. Next articleXiaomi crowdfunding Mijia launches Turok Steinhardt Glasses.